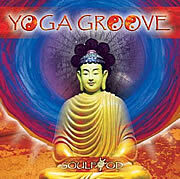 Over 60 minutes of rhythm, chill and ambient grooves designed to enhance fitness styles of yoga! DJ Free and Brent Lewis come together to create a rhythmic, melodic experience that’s the follow-up to the best-selling Yoga Rhythm. Eastern influences, and downtempo beats are fused with tribal percussion, indigenous flutes, sitar, mantras and atmospheric soundscapes. SOULFOOD mixed and arranged the tracks at Present Moment Retreat in Troncones Beach, Mexico under the guidance of Yoga director and Co-founder CJ Page. Musical guests include: Jayson Fann on percussion solos; Peter Schimke on piano and synthesizer; Richard Hardy on Native and bamboo flutes; vocals by Andra Suchy; sitar by T. Gordon Anderson; and bass by Enrique Toussaint. Yoga Groove’s mixing of tempos generates room for creative movement.…This is great for the modern day teacher/student.… Great for fitness yoga styles! SOULFOOD’s music moves my students and me into a deeper spiritual space, nourishing our souls with an overall feeling of health and wellness. Carla Friedman, Certified Yoga Instructor.